Commander Chris Hadfield may be the new poster boy for the Canadian Space Agency, but before the Mustachioed Ontarian hit the scene that crown was held by the supremely versatile Canadarm telerobotic system. Now a new generation of robo-arms are taking to the skies, where they'll act as orbiting satellite mechanics. The Canadarm is a remote-controlled robotic manipulator arm, originally devised as a Shuttle Remote Manipulator System for extracting items from the Space Shuttle's cargo bay while in orbit. 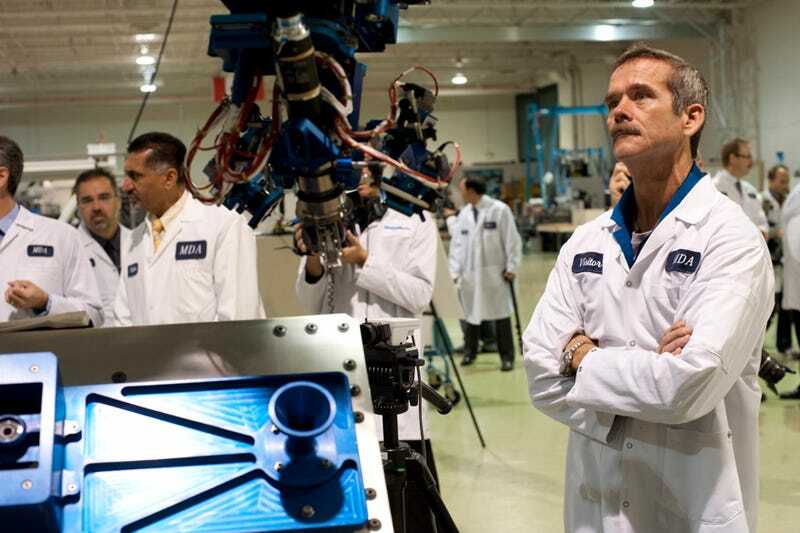 The next generation of Canadarms, dubbed "Next Generation Canadarm" (NGC), are built by MacDonald, Dettwiler and Associates Ltd. (MDA) under contract by the CSA, and comprise four subsystems. The NGC has a 15 meter arm akin to the Canadarm 2 but, lighter and more compatible. Though it can telescope out to nearly 50 feet and features six degrees of freedom—both handy for grasping passing satellite—the 15 meter arm folds down to just 16 square feet, about the size of a Chevy Astro van, in order to fit into the current generation of spacecraft. The system also includes a smaller 2.5 meter arm designed more for dexterity (it is built off the previous Dextre arm design used aboard the ISS) in order to actually carry out repairs on satellites that the longer arm captures for docking. As such it is equipped with an array of tools, imaging devices, and graspers. Its duties will include replacing dead components, manipulating fuel valves, and transferring propellant from the service craft to the client satellite. And like its predecessor, the 2.5 meter arm can hitch a ride atop the longer arm to move between various workstations on each satellite. And to ensure that operators are comfortable with the systems before their clanging around multi-million dollar satellites in the icy grips of space, the NGC also includes a simulation testbed and semi-automated docking abilities. The testbed allows flight engineers to simulate the prescribed mission plan and practice capture and docking procedures under realistic conditions (save for the gravity) and lighting. Aiding in actual docking procedures is the semi-auto docking system. Once the target satellite is within range (after it's been grabbed by the 15 meter arm) the docking routine takes over and joins the two spacecraft using sensors to guide the umbilical rather than having a remote operator handle it.